When the Corvette ZR1 entered the world for the 1990 model year, it was the first of the “Super Corvettes” that offered power and handling that matched, if not outclassed, many exotics. Hitting 60 mph in the 4-second range was awe-inspiring back then, but one needed to have a fat wallet to be able to buy one. But today, you may be able to score this 1990 ZR1 for less than what it cost new. 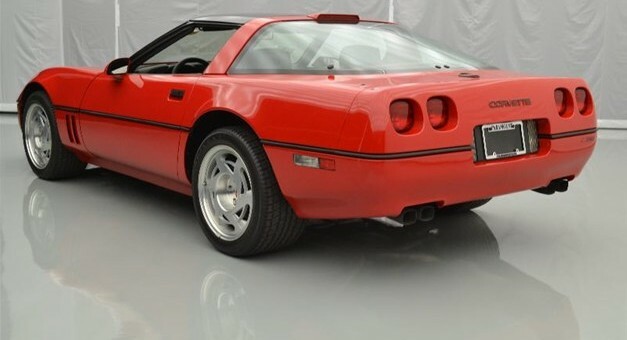 Distinguished from the outside by distinctive square-shaped taillights in a convex fascia (versus round lights in a concave cavity for the regular C4 Corvette), widened rear, and extra-wide tires, the 1990 Corvette ZR1 was powered by a Lotus-designed and Mercury Marine-built 350 ci (5.7-liter) V8 with dual-overhead camshafts and 4 valves per cylinder making 375 horsepower. That’s quite a healthy number considering that the base C4 Corvette only made 245 horses at the time. Anyone interested in a new 1990 Corvette ZR1 would have to pony up at least $58,995 to own one. Through 1995, a grand total of 6,939 ZR1s were built, and today — even though the standard C7 Corvette Stingray would clobber it — there’s still something special about a twin-cam Vette, especially from a time when most V6 motors struggled to top 200 horsepower. And this one on eBay has only 127 miles and is claimed to have the lowest amount of miles known. Painted in classic Bright Red with a black leather interior and equipped with a 6-speed manual gearbox, 3.45 gears, Z51 performance handling package, and removable roof (the ZR1 was not available as a convertible), among other options, this one is for the Corvette collector who has the best of everything else and wants to expand his collection. Currently, the big sits at $26,300 without having met reserve. These are not good investment as of now. The only thing this one has going for it I the low miles which means you can’t drive it. With the higher present HP and the expense and difficulty of finding parts these cars have been our favor with many owners. I have seen one where the owner dumped the stock engine and put in a late model LS engine. Not a word about this car’s provenance mentioned on the ebay listing = no sell. It as a no sell as they are like a 928 Porsche where the real collectors at this point of time really have little interest and the market is not all that good for them. Good examples can and have been easily bought for under $30K. My boss has one and he got it cheap and is a extensive Corvette collector. In time the interest may come back to these but the cost of repair and buying scarce parts will always be a problem. Not enough of these around to warrant much in reproduction parts. Scott speaks the truth. In fact, NO C4 Corvette is worth restoring or collecting (as a blue chip investment) at the moment. C4 Vettes are notoriously expensive to replace parts on – especially electronics and interior parts. And they are overshadowed style and performance wise by the earlier C3 and later C5+ cars. Thanks for the back up on this to the two people with no clue. The real issue is the Mercury DOHC engine as there were so few made vs. the normal LT engine. The parts over the years have been used up and things like Fuel pumps etc. can be very expensive. This in the end has scared off collectors as they just do not see the value. Now in later years if fewer of these cars remain road worthy these could be a very desirable car in much the way the Superbirds are today. When they were new and as they aged few people wanted them. Now after 35 years the desire has come around to where they are high demand. But that is to be determined with this car yet. It is still too young to demand too crazy money and whether it will or not will lie with the collectors. I have always liked the ZR1 as a car but not as an investment at this point. The thing right now from the 80’s that drives price is low miles but that is no guarantee that as time goes on or if you drive the car that value will remain. I have seen 5 mile 1984 Fiero’s sell for $16K but if you drive it the car will become a clean $3K car fast. If I were to invest in an 80’s car I would look for an original Syclone, Typhoon, GN, or the best one the TA Indy Turbo V6. If you can find a clean all original unmodified version of any of these you will have a true investment. Another oddity that may prove of some value is the TA with the notchback option. So few were sold.